Product and system support is important to us. Below are some FAQs & answers which you may find helpful. (You may also find our ‘How To’ Videos page useful). For answers to frequently asked questions (mounting heights, the Standards, refuge area, etc) you can download our information leaflet. I have commissioned my OMNICARE system, but the REFUGE REMOTES say “SYSTEM IN STANDBY” when I press the button. 1. Temporarily (for system testing, etc): Activate the fire panel interface. 2. Long term: Fit a jumper to J5 on the back of each remote (see image). Do I need a BVOCNTO/M termination card? The act of of adding the BVOCNTO/M termination card to an Omnicare panel enables the addition of another loop where one may be required, for example in a stairwell or other area. Alternatively, the card may add the ability to network to other panels on the system. My OMNICARE CONTROL PANEL is showing ‘Battery high’ / ‘Processor fault’ / ‘Common fault’ after new batteries have been fitted. The system needs to be reset: switch the system off at the mains, disconnect the batteries, count to ten. Refit the batteries, switch on the mains power then press the reset button. 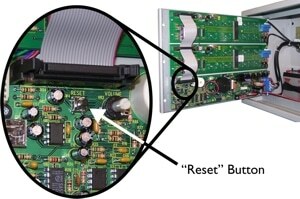 INTERNAL: The reset button is used for a variety of different operations, however, most of these activities are only performed when testing or commissioning the system. The button is mounted internally to prevent accidental or inadvertent use. 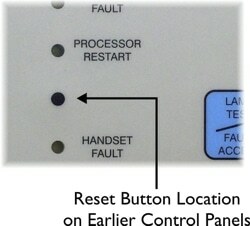 PLEASE NOTE (EXTERNAL): On earlier control panels the reset button is located on the front panel, in between the ‘Processor Restart’ and ‘Handset Fault’ LEDs. The button does not have an label but is identified by a black dot. Is the ‘combined’ (fire telephone/disabled refuge) unit ‘1’ or ‘2’ addresses? One address – seen as one point on the master control panel. Which British Standards do I need to refer to? BS9999:2008 – for refuge area definitions and specification. BS5839-9:2011 – for design, installation, commissioning and maintenance guidelines. BS8300:2009 – for disabled toilet alarm and code of practice on accessible buildings. When do I need a refuge system? A refuge system provides two-way voice communication between a refuge area and building control. To help you assess the need for refuge areas read our ‘When do I need a ‘REFUGE AREA‘? document. The BVSMP POWER SUPPLY is showing ‘fuse fault’ (permanently lit, not flashing). Check the power lead is connected firmly. Check / replace fuses (two in the back of the unit). If the ‘fuse fault’ remains lit: Repair or replace unit. To protect the average user, Windows 8 requires all hardware drivers have a digital signature. Download the document for assistance with EVAS config and Windows 8/8.1. What is the HEAT DISSIPATION of the BVSMP / AMPLIFIERS? Please refer to separate leaflet. How many LOUDSPEAKERS can I wire to your AMPLIFIER? 20 x loudspeakers tapped at 5 Watts = 100 Watts. For voice alarm (as stated in BS5839-8) “The amplifier’s rated power output should be at least 20% greater than the initial design for the loudspeaker load”. Therefore, in our example, 20 x 5 Watts = 100 Watts + 20% = 120 Watts (our BV125D 125 Watt amplifier would be required). Do we maintain other manufacturers’ equipment? No, we offer a full maintenance and commissioning service for Baldwin Boxall products only. How often does a voice alarm system require maintenance? Bi-annually: detailed inspection and testing – including battery function. Annually: full testing and inspection – including sound pressure levels. How often does a disabled refuge/fire telephone system require maintenance? Weekly: operation and check by user. Monthly: battery/emergency generator check by user. Quarterly: batteries and connections assessed by competent battery installer/technician. Bi-annually: system function checks and testing, including batteries and indicators. Do we offer special finishes? This is always possible, however, it tends to be costly. If this is something you are interested in please forward the details to our Sales Team and they will be happy to provide you with a quotation. Do we supply products to electrical contractors? Any enquiries received will be redirected to our established network of distributors and key customers. If you can’t find what you’re looking for give us a call on +44 (0)1892 664422 and let us know how we can help you?